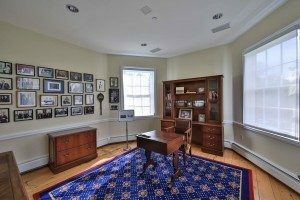 Langhorne Carpet Company produced a specially commissioned replica Senate carpet for the new Specter Center in the historic Roxboro House. The Center is located on the Thomas Jefferson University East Falls Campus (formerly Philadelphia University and Philadelphia College of Textiles and Science). The carpet was designed by Robin Althouse ’19, a graduate student in Textile Design. It compliments Arlen Specter’s Senate chair and desk. Specter donated the archive. It includes some 1,400 boxes of papers, photos and memorabilia to Philadelphia University, now Jefferson, in late 2010. After his death in 2012, Philadelphia University partnered with the University of Pittsburgh—whose staff has considerable expertise in managing large political collections—to organize, process, digitize and store the collection. Arlen Specter’s senatorial career spanned over 30 years. The notable collection documents his major legislative and political accomplishments. The Roxboro House was built in the 1800’s. It is both “a historic and important touchstone to both Philadelphia and America’s origins by Senator Specter, making it the ideal location for the Center,” according to Jefferson University. Langhorne Carpet Company it known for custom design work and historic reproductions. Langhorne also weaves small minimum jobs per customer requests, and can serve as a one-stop partner for design assistance and fabrication. Langhorne Carpet is made from the highest quality wool from either New Zealand or the United Kingdom. Our wool buyers know that every yard we acquire must be the best available. There is simply no finer wool in the world. The best synthetic imitation cannot compare to our carpet when it comes to color, clarity, texture, feel, fit and finish.